Did you know you can stow stuff in the seat of your chair? 1. 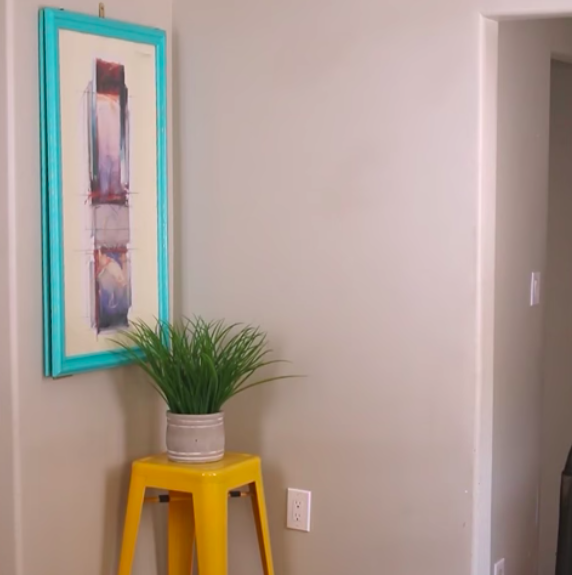 Turn two $8 Ikea tables into one sneaky storage space. Remove the legs from the Ikea lack table and cut a square out of the underside of the table with a straightedge. After removing the stuffing, apply wood glue, and wedge in a wood piece on each side of the hollowed out square. Repeat these steps with the second table and then attach the two with hinges. Install gas springs so the table doesn't slam, and reattach the legs. See it here. Get the table from Ikea for $7.99. 2. 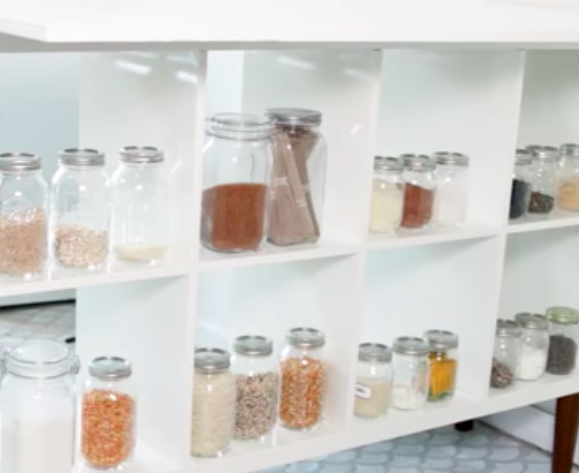 Attach magnets to the bottom of your cabinets to hang your spices. Attach a 12-inch bracket to the shelf and then stick on the magnets. Fill 4-ounce mason jars with spices — the magnets will attract the metal tops. See it here. 3. Or make a drop-down spice rack out of a small briefcase, if you want to keep them in their original jars. Glue a board in the middle of the case to add an extra shelf and attach a chain to both sides. Hang the case from the bottom of the cabinet. See it here. 4. Attach a wooden board and hinges to a chair to stow your stuff in the seat. Remove the seat and attach a square piece of wood to the bottom of the chair. Use wood glue to line the wood with felt. Do the same to the bottom seat before attaching it to the chair's frame with hinges. See it here. 5. Build this stovetop cover to get more counter space for all your prep work. Add handles so you can carry the whole spread to the living room in one trip! See it here. 6. Hide a murphy table behind a painting, so you don't need to clutter the space with an actual piece of furniture. 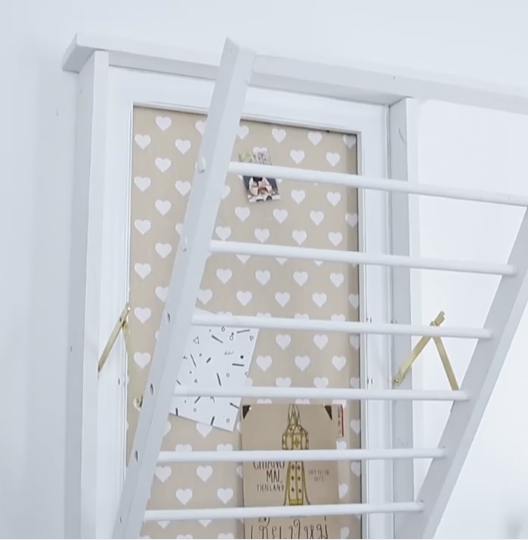 Paint a wood board the same color as the frame and attach the two with hinges. Attach a second set of hinges to the opposite side of the board to attach it to the wall. Hang the table back up with a hook and eye fastener. See it here. 7. 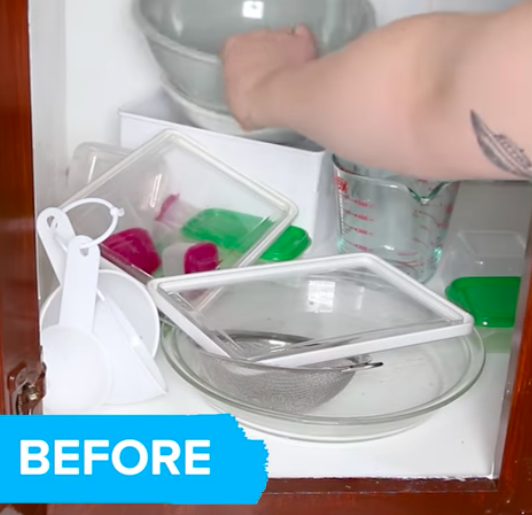 Hook your kitchen tools on a towel rod to clear out a messy drawer. You'll be able to easily slide around the s-hooks to accommodate equipment of all shapes and sizes! See it here. 8. Or hide your kitchen equipment on a sliding rail inside an awkwardly sized cabinet. Measure out a wood piece the length and width of the inner rail of a shelf slide. Attach the two with screws and drill hooks into the other side. 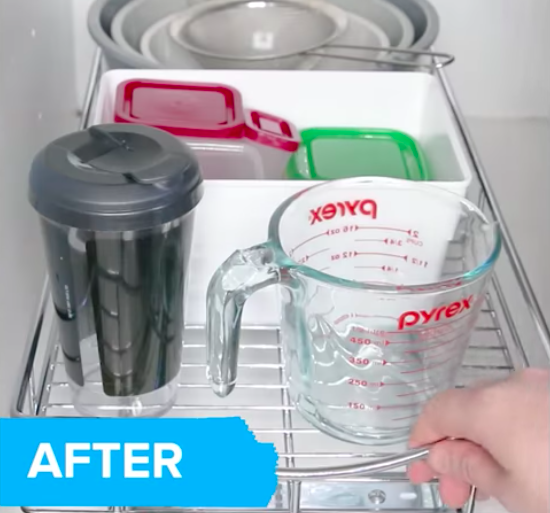 Attach the inner rail to the top of the cabinet and hang all of your kitchen supplies. See it here. 9. Build a floating drawer with a few boards and drawer slides. All you'll need is a few pieces of wood, corner braces, and drawer slides. You'll first build a three-sided box (the shelf) and then a four-sided box that's slightly smaller (the drawer). After attaching the drawer slides to both boxes, attach French cleats to the shelf and the wall to hang. See it here. 10. 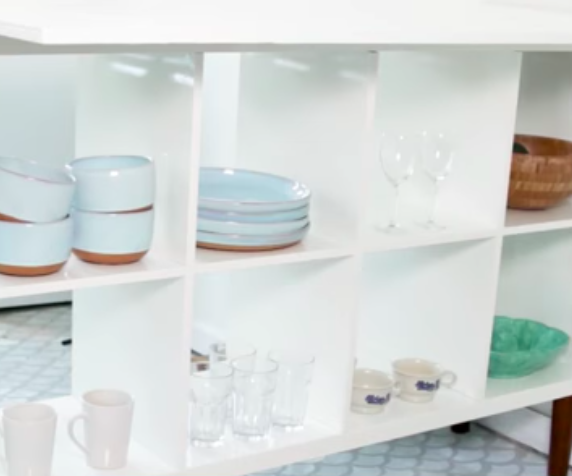 Attach a metal rack to a shelf slide so you can actually access the entire cabinet. The shelf will easily slide out so you can reach the stuff in the back and keep the cabinet organized. See it here. 11. Turn a bookcase into a storage-friendly countertop with a set of legs and a butchers block. The wood top should hang over by eight inches on each side. Sand, seal, and paint the wood and organize the shelves as you like. See it here. 12. Stash your secrets (or mess) in a false bottom made of a board glued to corks and a sneaky handle. Glue wine corks to a wood piece the size of your drawer. Flip the board over and glue a discreet handle (like a fork, paint brush, or screw driver). After allowing the glue to dry for 24 hours, place the false bottom in the drawer. See it here. 13. Add casters to the bottom of a drawer to take advantage of under-the-bed storage space. Decorate the drawers to match your room! See it here. 14. Or attach casters to the bottom of a shelf to slide your pantry out of sight. Build your frame, varying the height of the shelves based on the height of the staples you're storing. Attach pegboard to one side to act as a backing and add rods to the opposite side so nothing falls off the shelves. Add the casters and slide your pantry into place. See it here. 15. 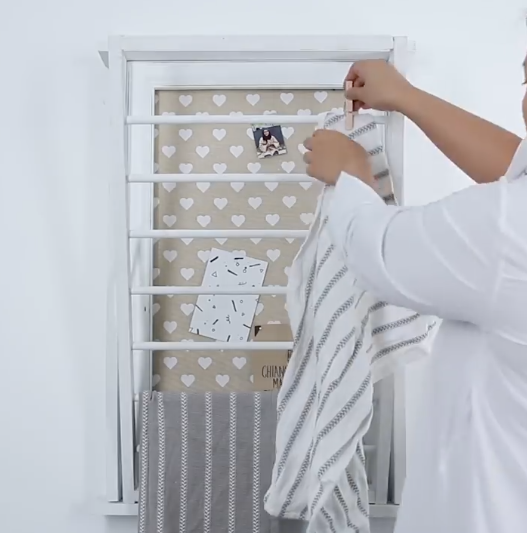 And turn an old frame into a murphy drying rack if you don't have any room to hang up your wet clothes. Attach four boards to the picture frame. Cut four more boards — slightly shorter on each side — and drill holes large enough for the dowels to slide through. Use a cabinet lid support hinge to attach the drying rack to the frame. Hang the whole thing on the wall using French cleats. See it here.